Note: Click Here to see another version of this article. I hope you like it as well as new Readers to this site. “I firmly believe that the American and Russian space program secrets are twofold, one is that the Earth is definitely stationary and the other is . . . space travel is bogus and is impossible beyond the Van Allen radiation belts . . . nothing of human origin has passed that gate, so the prince of all lies is forced to create an entire imaginary universe and solar system based solely on images from land-based astronomical observatories! After all, we must accept that the “Prince of the power of the air” has dominion here for a small time? “To make interstellar travel believable NASA was created. The Apollo Space Program foisted the idea that man could travel to, and walk upon, the moon. Every Apollo mission was carefully rehearsed and then filmed in large sound stages at the Atomic Energy Commissions Top Secret test site in the Nevada Desert and in a secured and guarded sound stage at the Walt Disney Studios within which was a huge scale mock-up of the moon. The tremendous radiation encountered in the Van Allen Belt, solar radiation, cosmic radiation, temperature control, and many other problems connected with space travel prevent living organisms leaving our atmosphere with our known level of technology. The groundwork is being laid . . . by NASA/Barry Goldstein et al and by Hollywood/Steven Spielberg et al and by Zionist PSY-OP agencies of “crop circle” builders and UFO Shysters like Steven Greer . . . for a future Orson Welles 1938-type “War of the Worlds” FAKED/STAGED alien attack and/or FAKED/STAGED messiah advent-coming……to rule the world ( special note: space aliens or ETs are fictional characters only and do NOT exist except in some people’s imaginations ). Chabad-Lubavitch movement … some Chabad Hasidim believe that he will return as the Messiah. “The first and most primary problem for a Christian in the ‘alien messages’, is that the ‘Extraterrestrials’ have carefully but certainly usurped the role of God. They appear as transcendent beings that are superior to man. They know what we don’t know, see what we don’t see, and can solve what we can’t solve. Second, they usurp the role of God as Creator. God is not our Father, the ‘Extraterrestrials’ are. Third, if they are our creators, then we must owe something to them. How about our souls, our hearts, and our allegiance? Question: Why is it ( the stationary Earth truth ) important? = existing “crime” ( sin ) rate collapses. WAKE-UP ICR ( Institute for Creation Research ) and AiG ( Answers in Genesis )!!! More HERE. If the Earth were going around the Sun, then the speed of the satellite would have to adjust due to the different gravitational pull of the Earth. When the satellite is behind the Earth it would have to “chase” the Earth. When in front of Earth, the Earth would chase the satellite. Since the Earth is supposedly going around the Sun with the speed of 107,534 km/hr, the speed of the satellite would have to DRASTICALLY change to account for the change of the gravity pull. If the universe revolves around the Earth, Earth’s gravitational pull on the satellite would be the same regardless of its position on the orbit. Furthermore, the Sun and Moon’s gravities acting on Earth would balance. The Sun is bigger but farther. The Moon is smaller but closer. 1. The Earth doesn’t have centrifugal force. Gravity is the same all over the Earth because the Earth doesn’t move. If it did, the centrifugal force would make objects weigh TWICE less on Equator than for example in Vancouver, Canada. 2. Doing the same experiment with a SOUND WAVE fortunately can check this. Doppler’s effect would apply. 3. Michelson-Morley experiment doesn’t indicate that the light travels with the same speed independent of Earth’s motion. It indicates that the Earth is stationary. 4. Microwave radiation is 2.7 all over the Earth because the Earth doesn’t move. 5. Weight of objects would be affected depending on which side of the Earth they would be. The “density distribution” theory wouldn’t help, because it would have to change non-stop as the Earth rotates. If the weight of objects is not changing with the location on Earth, then the centrifugal force couldn’t possibly make the Earth bulge at the equator. That proves Newton wrong. 6. The Earth doesn’t have its “density” distributed so exactly as to ideally match the centrifugal force. Such argument is self-serving, arbitrary and logically invalid because there is no evidence to measure it and therefore to support it. ( Note Earth’s “density” for which there is no evidence other than that it “has to be this way” ). 7. The shapes of “constellations” don’t change over thousands of years. 8. Earth is the only planet with millions of life forms. The Bible mentions only life on Earth. 9. Only humans are capable of having a “point of view”, therefore it’s OUR point of view that matters as CENTRAL. 10. Copernicus didn’t provide evidence to support his theory. 11. Contrary to Copernicus, it’s not mathematically possible to “calculate” if the Earth is revolving around the Sun. 12. Newton’s thought experiment with a bucket of water, indicates that the Earth is not revolving. ( The water should sway if the Earth was revolving ). That’s a classic example of lack of centrifugal force of supposedly rotating Earth. Now we know that the Earth is not flattened on the top and bottom. If that was true, objects would weigh differently. 13. On time-delayed pictures of stars, the Polaris star almost doesn’t move. The only way it can work is if both the Earth and Polaris don’t move. The Earth is therefore the centre of the universe and Polaris is its end. 14. The circular movement of stars on time-delayed pictures cannot be created by Earth’s rotation. If the Earth revolved the paths of stars would be horizontal not circular. 15. Satellites go around the Earth because the space around revolves, thus acting on satellites. You can even put a can of Coca Cola and make it a satellite. 16. The constellations don’t change, year after year. 17. Heavenly bodies don’t collapse together, because their attraction is perfectly balanced by equal centrifugal force resulting from revolving around the Earth. 18. The universe is found to expand AWAY from the Earth with EQUAL speed, that means that the Universe STARTED from the Earth. 19. God started to create the Universe from the Earth, why would a Perfect Being put it later somewhere else? Wouldn’t he put it where it was supposed to be right away? He is perfect so why would He NOT start from the CENTER, as the center is perfectly balanced and therefore requires less effort to start there. By the way, did I mention that the Bible says that God created the sphere of the Earth and hang it on nothing? That was when no human could imagine the Earth hanging on nothing. The Bible also says that the Earth is MOTIONLESS. Since rotation is “motion” and there is no motion, hence the Earth doesn’t rotate. If the Earth is moving around, then the stars should “move” horizontally, with slight bent upwards on northern hemisphere and a slight bent downwards on southern hemisphere. That’s because the Earth is a sphere. The stars should appear to move in the opposite direction to Earth’s movement. In fact, the stars are moving in a circle, around the star Polaris. Hence, “Polaris Effect”. The stars on the outside of Polaris move faster. It is because the distance they travelled is bigger. They also move in unison, which proves that they are somehow connected. To make it even more puzzling, the time interval of the film exposure does not match the part of the circle that the star would travel in that part of day. I mean if the time exposure is 4 hours, then if 24 hours is full circle then 4 hours should be one sixth of the full circle. However, it’s only about 1/12. The direction of stars’ rotation seems to be the same as Earth’s… If Earth is turning from left to right, then the stars should appear to turn from right to left! If the stars move from left to right, then Earth may be stationary. The Polaris star is always stationary. The only way a point can remain stationary, is when both the observer and the point are stationary, or both move in unison. Since the other stars move in unison relative to the Earth, then both Polaris and Earth must be motionless! This artist’s concept depicts NASA’s Phoenix Mars Lander a moment before its 2008 touchdown on the arctic plains of Mars. Pulsed rocket engines control the spacecraft’s speed during the final seconds of descent. Ever since Victorian astronomers pointed their telescopes towards Mars and wrongly believed they had discovered canals, mankind has been obsessed by the red planet. Now these astonishing new images – captured by a European spacecraft in orbit around Mars – are helping to fuel that fascination. They show in astonishing detail a network of giant valleys, vast plains and towering waterfalls carved into the surface of our neighbouring planet, millions of miles away. And while Mars today appears lifeless and parched, they are a reminder of how its surface was shaped by fast flowing streams, rivers and oceans. The pictures were captured by the European Space Agency’s Mars Express Probe – a spacecraft the size of a large fridge-freezer that has been circling Mars since Christmas 2003. Mars Express infamously gave Britain’s ill-fated Beagle 2 probe a lift to Mars. While that mission ended in disaster, the Mars Express has been a fantastic success. Over the last five years its stereo, high resolution camera has taken thousands of images of the surface, revealing the planet’s awe inspiring beauty in unprecedented detail. The latest images show the Echus Chasma, a vast valley just north of Mars equator around 62 miles long and six miles wide. The feature is cut into a high plateau and its steep-sided cliffs – some 12,000 feet high – bear a striking resemblance to the canyons of North America. Thunderous waterfalls may have once plunged over these cliffs, from the high Lunea Planum plateau that surrounds the Echus Chasma, on to the valley floor below. Some of the images show a five mile wide impact crater formed when asteroids – lumps of floating rock in space – smashed into Mars. Others show a 15 mile long dyke formed when molten rock, evidence of Mars’s volcanic past. At the edges of the main valley lie smaller light-coloured tributary valleys or “sapping canyons” – around six miles long and 1800 feet deep. The Echus Chasma – described by Nasa as one of the largest water sources on the planet – is connected to a much bigger valley system called the Kasei Valles which extends thousands of miles to the north. Both valleys are impressive – but are dwarfed by an even larger canyon which lies to the south. The Valles Marineris is four miles deep in places, around 120 miles wide and 2,500 miles long. Mars Express launched in June 2003. The craft is a cube around 5ft by 6ft by 5ft with two 60ft long radar antennae. It is photographing the entire surface of Mars in high resolution, producing a detailed colour map of the minerals on the surface, mapping the atmosphere and probing beneath the surface using radar. Interest in Mars is at an all time high. Nasa and ESA have announced plans to bring back rocks and soil samples from Mars, while Nasa has three probes on the planet – two rovers and its Phoenix polar lander, which arrived in May. The Phoenix has scraped ice from beneath the surface of Mars and is analysing samples in its laboratory to see if the planet has the right chemicals needed for life. In 2013, ESA is planning to launch ExoMars – a robotic rover than will explore the planet’s surface. 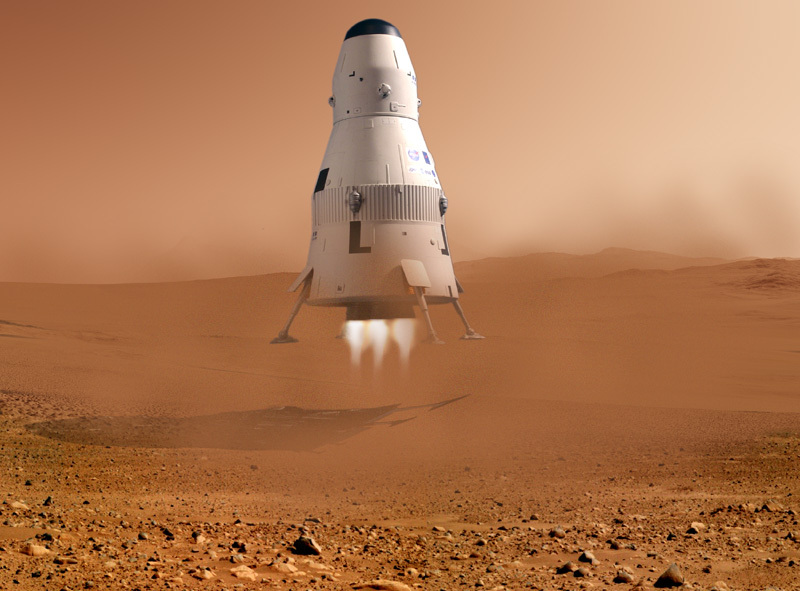 If successful, it will be Europe’s first mission to the Martian surface. Scientists unveiled plans on Monday to bring back rocks from the Red Planet as a preliminary step to putting a man on Mars. Professor Monica Grady, at the Open University, co-chaired the expert panel that wrote the mission proposal. She said it was a vital next step before considering a crewed mission. ‘If you can’t bring a rock back you are not going to be able to bring people back,’ she said. This entry was posted in Fake Mars, Planets and tagged Fake Mars, fake Mars landing, mars landing fraud. Bookmark the permalink.